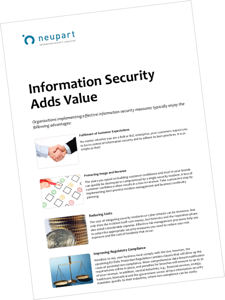 Download here below our six reasons to why information security adds value to the business. If you are a manager, you may already be interested in information security. These six reasons stress why you should maintain your interest. Perhaps you also have colleagues who need to see the value more clearly. If you work with information security and you think you would like to explain to your colleagues, or perhaps even your manager, the value that your work offers, you may use the same six reasons. The paper may be distributed within your organisation with a clear statement of reference.